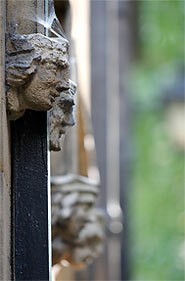 The depth of field does not abruptly change from sharp to unsharp, but instead occurs as a gradual transition. In fact, everything immediately in front of or in back of the focusing distance begins to lose sharpness — even if this is not perceived by our eyes or by the resolution of the camera. Since there is no critical point of transition, a more rigorous term called the "circle of confusion" is used to define how much a point needs to be blurred in order to be perceived as unsharp. When the circle of confusion becomes perceptible to our eyes, this region is said to be outside the depth of field and thus no longer "acceptably sharp." The circle of confusion above has been exaggerated for clarity; in reality this would be only a tiny fraction of the camera sensor's area. When does the circle of confusion become perceptible to our eyes? An acceptably sharp circle of confusion is loosely defined as one which would go unnoticed when enlarged to a standard 8x10 inch print, and observed from a standard viewing distance of about 1 foot. At this viewing distance and print size, camera manufactures assume a circle of confusion is negligible if no larger than 0.01 inches (when enlarged). 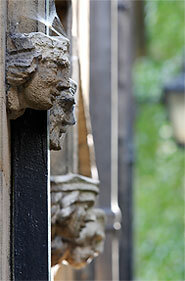 As a result, camera manufacturers use the 0.01 inch standard when providing lens depth of field markers (shown below for f/22 on a 50mm lens). In reality, a person with 20-20 vision or better can distinguish features 1/3 this size or smaller, and so the circle of confusion has to be even smaller than this to achieve acceptable sharpness throughout. A different maximum circle of confusion also applies for each print size and viewing distance combination. In the earlier example of blurred dots, the circle of confusion is actually smaller than the resolution of your screen for the two dots on either side of the focal point, and so these are considered within the depth of field. Alternatively, the depth of field can be based on when the circle of confusion becomes larger than the size of your digital camera's pixels. Note that depth of field only sets a maximum value for the circle of confusion, and does not describe what happens to regions once they become out of focus. These regions also called "bokeh," from Japanese (pronounced bo-ké). Two images with identical depth of field may have significantly different bokeh, as this depends on the shape of the lens diaphragm. In reality, the circle of confusion is usually not actually a circle, but is only approximated as such when it is very small. When it becomes large, most lenses will render it as a polygonal shape with 5-8 sides. Note: Depth of field calculations are at f/4.0 on a Canon EOS 30D (1.6X crop factor), using a circle of confusion of 0.0206 mm. This exposes a limitation of the traditional DoF concept: it only accounts for the total DoF and not its distribution around the focal plane, even though both may contribute to the perception of sharpness. A wide angle lens provides a more gradually fading DoF behind the focal plane than in front, which is important for traditional landscape photographs. 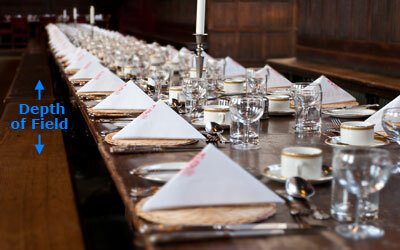 Longer focal lengths may also appear to have a shallower depth of field because they enlarge the background relative to the foreground (due to their narrower angle of view). This can make an out of focus background look even more out of focus because its blur has become enlarged. However, this is another concept entirely, since depth of field only describes the sharp region of a photo — not the blurred regions. On the other hand, when standing in the same place and focusing on a subject at the same distance, a longer focal length lens will have a shallower depth of field (even though the pictures will show something entirely different). This is more representative of everyday use, but is an effect due to higher magnification, not focal length. Depth of field also appears shallower for SLR cameras than for compact digital cameras, because SLR cameras require a longer focal length to achieve the same field of view (see the tutorial on digital camera sensor sizes for more on this topic). *Technical Note: We describe depth of field as being virtually constant because there are limiting cases where this does not hold true. For focal distances resulting in high magnification, or very near the hyperfocal distance, wide angle lenses may provide a greater DoF than telephoto lenses. On the other hand, at high magnification the traditional DoF calculation becomes inaccurate due to another factor: pupil magnification. This reduces the DoF advantage for most wide angle lenses, and increases it for telephoto and macro lenses. At the other limiting case, near the hyperfocal distance, the increase in DoF arises because the wide angle lens has a greater rear DoF, and can thus more easily attain critical sharpness at infinity. In order to calculate the depth of field, one needs to first decide on an appropriate value for the maximum allowable circle of confusion. This is based on both the camera type (sensor or film size), and on the viewing distance / print size combination. Needless to say, knowing what this will be ahead of time often isn't straightforward. 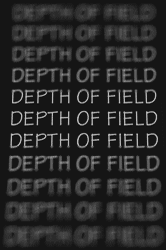 Try out the depth of field calculator tool to help you find this for your specific situation. 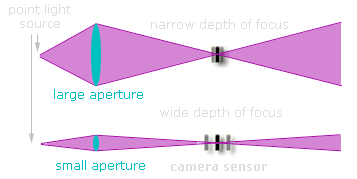 Diagram depicting depth of focus versus camera aperture. The purple lines represent the extreme angles at which light could potentially enter the aperture. The purple shaded in portion represents all other possible angles. Diagram can also be used to illustrate depth of field, but in that case it's the lens elements that move instead of the sensor. The key concept is this: when an object is in focus, light rays originating from that point converge at a point on the camera's sensor. If the light rays hit the sensor at slightly different locations (arriving at a disc instead of a point), then this object will be rendered as out of focus — and increasingly so depending on how far apart the light rays are. 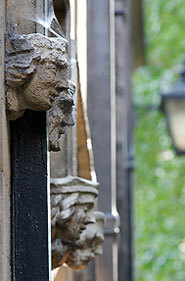 Why not just use the smallest aperture (largest number) to achieve the best possible depth of field? Other than the fact that this may require prohibitively long shutter speeds without a camera tripod, too small of an aperture softens the image by creating a larger circle of confusion (or "Airy disk") due to an effect called diffraction — even within the plane of focus. Diffraction quickly becomes more of a limiting factor than depth of field as the aperture gets smaller. Despite their extreme depth of field, this is also why "pinhole cameras" have limited resolution. The Luminous Landscape compares the depth of field for several focal lengths — providing visual proof that depth of field does not change much with the focal length.